This lovely cable protector was a gift from my boyfriend. I am travelling throughout the UK and today is the fifth day of my travel. I take so many pictures using my iPhone that it needs a supplementary battery, so I always carry a cable and cable protector with me. 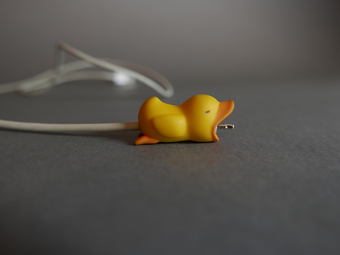 This one is shaped like a little duck, and the cable passes right through its body. It is so cute, but the most important thing is that it was a surprise gift from my boyfriend - he really knows my taste. Actually, I have another lovely cable protector at home, which is in the shape of a tiny piggy (that’s a secret ;-D).